Microbeads are tiny plastic particles used in body care products that act as exfoliants, or abrasives. Microbeads do not disintegrate and end up in our waterways contaminating water for fish and other marine life. Microbeads can be made of different types of plastic including polyethylene, nylon, polypropylene, and polyethylene terephthalate to name a few. These microbeads are usually around 2-5 millimetres in size, however they can be so small that they are invisible to the naked eye. Numerous products contain these microbeads such as body washes, cleansers, face masks and scrubs, and toothpastes. These microbeads cannot be filtered out of our water and end up in our waterways and oceans where they are consumed by marine life. 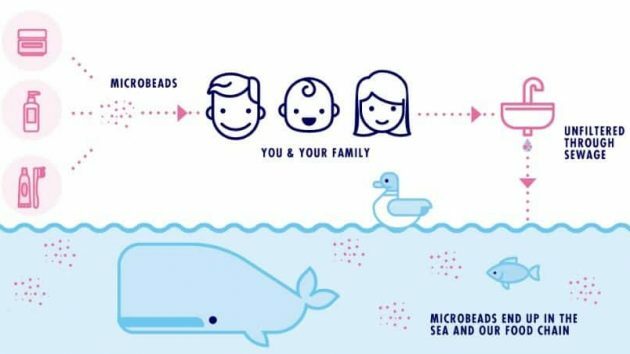 Microbeads can cause animals serious harm, and they can even end up in our food chain if we eat animals that have ingested the plastic microbeads! As we believe in using all natural ingredients, and no nasties, Kosmea have never used microbeads in any of our products and instead use natural ingredients as exfoliants such as crushed chamomile flowers and ground rosehips. Our Daily Facial Exfoliant contains these natural ingredients along with kaolin clay and rice flour to help draw out skin impurities and improve skin clarity. Always be careful to check ingredients in your skincare products and be mindful of harmful ingredients and the impact they have not only on ourselves, but the environment as well.